Ugandan legislators have controversially – once again – demanded an increase in their monthly earnings. According to a report by AFP, the request was forwarded at the House of Assembly on Wednesday, April 2nd. Many online commentators have criticized the move, noting that it is unacceptable as the country continues to grapple with widespread corruption, high cost of living and importantly, the threat of losing some of the monetary aid it usually receives after its adoption of a contentious anti-homosexuality law earlier in the year. “but we are waiting for the response from the finance ministry,” she added. In 2011, a similar demand by parliamentarians for an increase in their earnings sparked widespread protests and confrontations with security agents. Ugandan MPs are reported to earn about Sh15 million to Sh20 million monthly. In addition to this, the legislators are allegedly supplied with hefty allowance packages. Many observers had accused the assembly of being prone to overspending after reports emerged in February of plans to provide iPads for MPs and conduct a two-month long training on operating the device in order to eliminate the need for papers and thereby speed up their work process. Last year, teachers of public institutions took to the streets to demand an increment in their wages. Many public workers have complained of being underpaid, and also accused the government of delaying the release of their emoluments – sometimes for many months. While some observers have noted that petitions for salary increase from legislators are known to attract heated public debates across the continent. Many have accused Uganda’s legislators of paying themselves more than 50 times the wage of the average citizen. Recently, the auditor general of Uganda disclosed that the country continues to lose billions of Shillings due to mismanagement and corruption, according to The Observer. 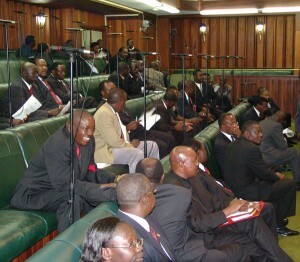 Photo by The Observer: Ugandan MPs in the House of Assembly.